Inspired by upcycling and making beauty out of scraps, we have a real inspiration treat for you and your modern handmade wedding! It's all about communicating with your guests in the prettiest way when it comes to their seating arrangements on the big day. 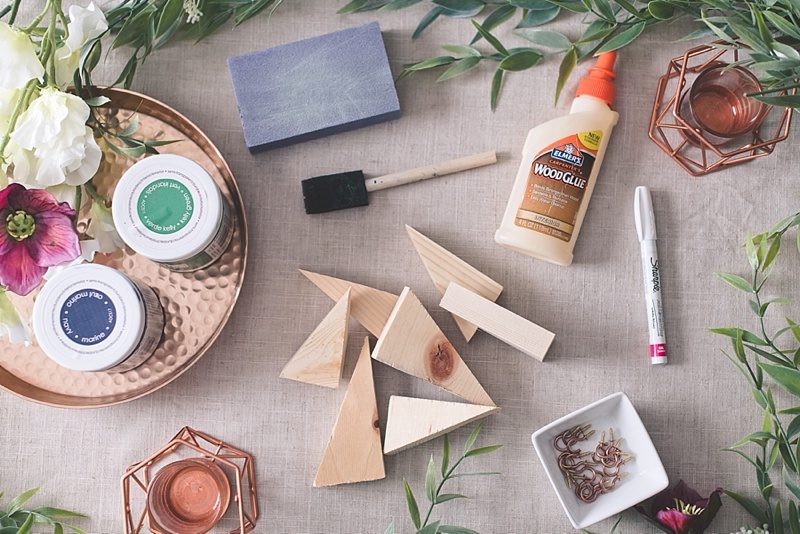 With wood scraps, some wood color stain, and one heckuva gorgeous copper display stand, we have envisioned a statement piece in of itself for our latest DIY tutorial project. 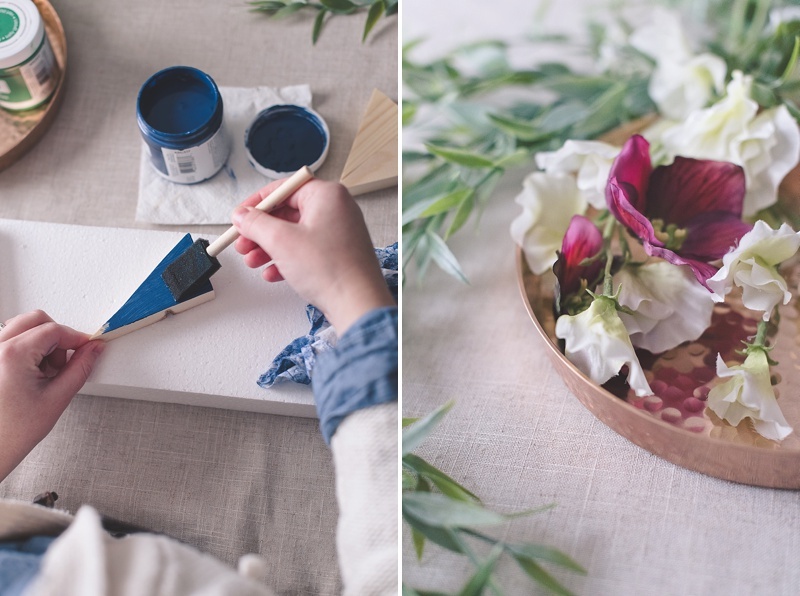 Grab those foam paint brushes and old rags to get started! 1. 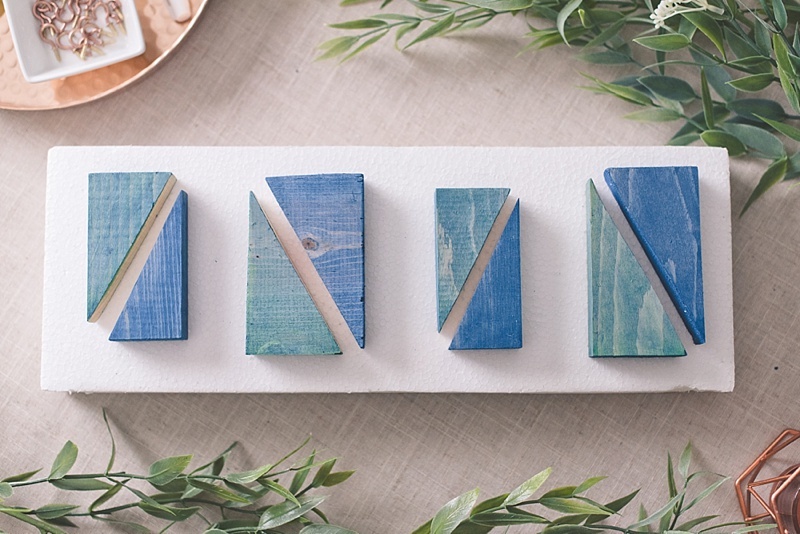 Arrange your wood scraps and find a shape or pattern that can be repeated for the amount of guests for your seating chart. The fun part about using scraps or upcycled wood is that you have to get creative in figuring out how it can work for your vision. If your scraps are all different shapes and sizes, use that to your advantage! 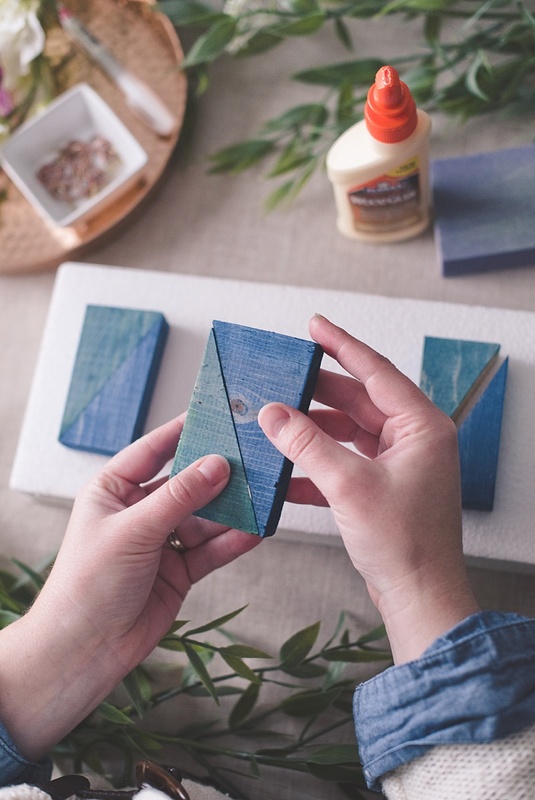 SOURCING TIP: Etsy is a great place to find wood scraps or wood shapes since most artists and creators don't like to waste valuable materials, so they will sell their not needed pieces at a great price. We found Hay Meadow Creek Crafts and loved that Jeannie sold not only non-upcycled wood pieces for those looking for a particular size/shape, but also the leftover bits that would otherwise be forgotten. We're huge fans of zero to low waste, and it gave us a challenge to figure out how to best use the irregularly-sized wood pieces for this project! 2. Sand the edges of your shapes if they are rough, pointy, or jagged. Consider sanding your all sides of your wood pieces if you'd like to best use your wood stain color, especially if they are found wood pieces. 3. 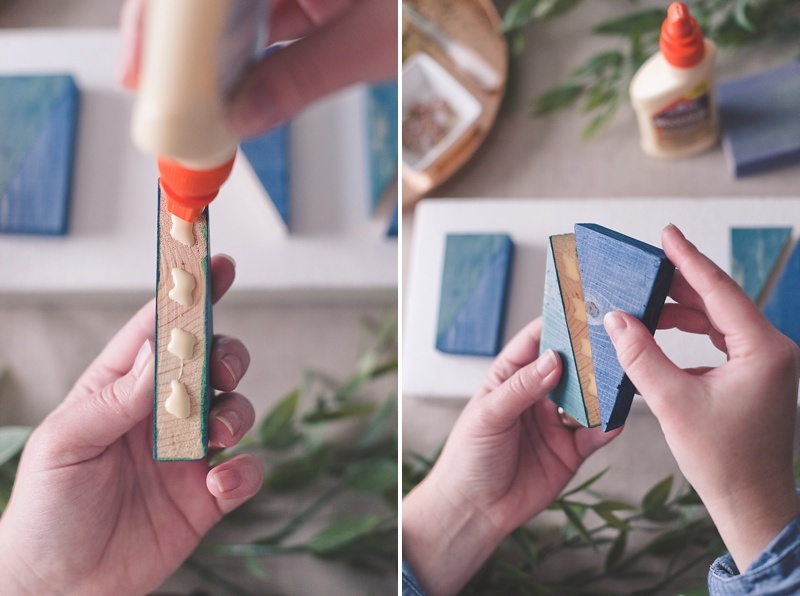 Starting with your first wood stain color, paint on your wood with a foam brush. When using wood stain, it will look rather opaque when applied. Allow it to sit for a few seconds and then wipe stain off with an old rag. Be sure that no remaining wet paint is left on the wood; you'll see the transparency of the wood grain from behind the stain. Repeat this for all of your first color blocks. 4. Using your second wood stain color, repeat Step #3. Allow to dry completely because if you want to do any layers of an additional color, you will need a dry surface. 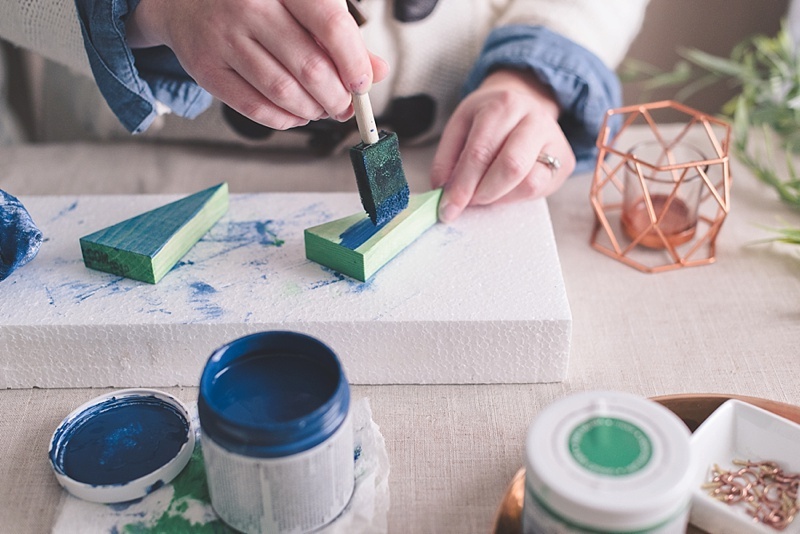 QUICK TIP: Using DecoArt color stain allows for custom color making, so get creative! 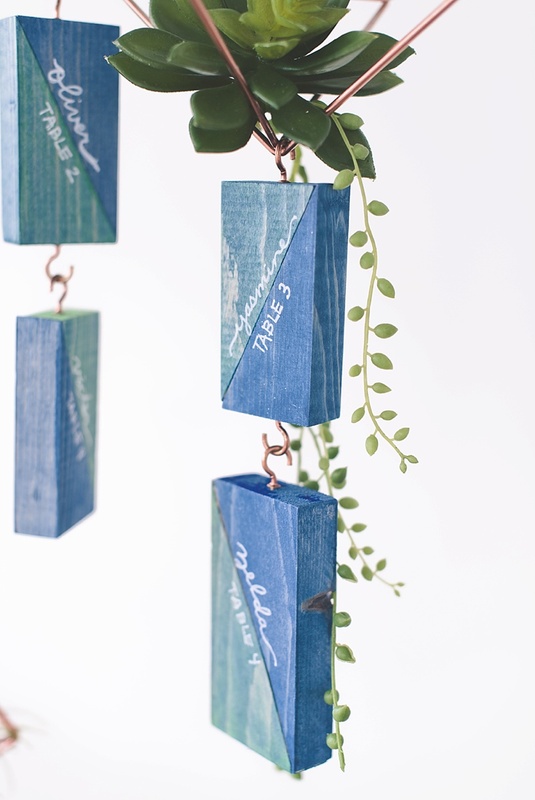 The Kelly Green was a bit too bright for our more muted color palette, so we wanted a second layer of navy blue over our green blocks to tone down the hue into a pretty dark teal. This is quality paint, so once it goes on your wood, it's staying there! Do any color tests on wood you're not using before your official painting. 5. 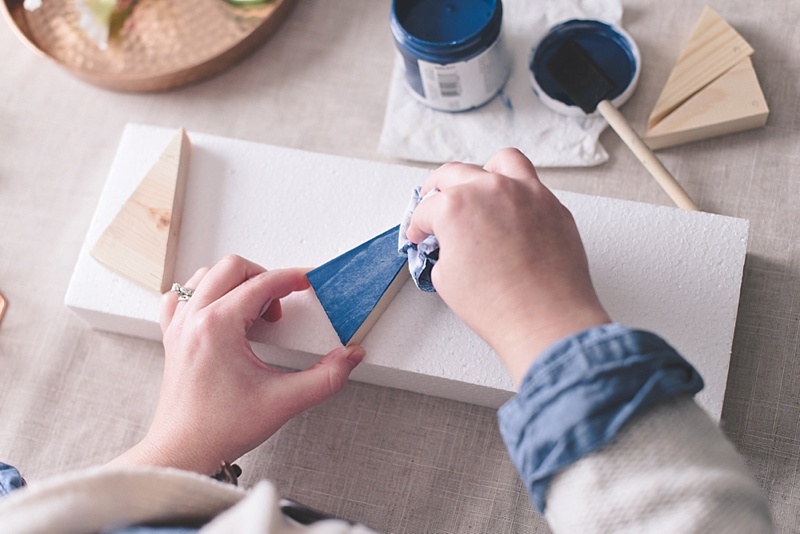 Allow all of your painted wood pieces to dry for 2-4 hours before handling the next few steps. After drying, arrange your pattern for your seating chart. Consider how many rows and columns you will need. We recommend drawing out a diagram! 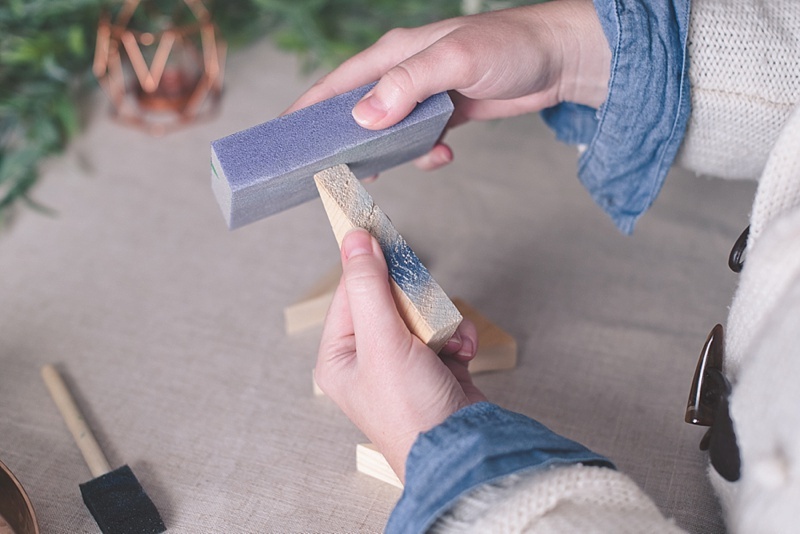 QUICK TIP: We upcycled styrofoam packaging from past online orders, and while we'd never personally buy it for any projects, it makes for great drying platforms because it doesn't stick to your wood pieces. So since you don't have any choice in how companies send you stuff, at least you can give some useful new life to styrofoam scraps that can't be recycled! 7. On the long angled edge of your wood pieces, place small glue dots with wood glue. When putting together the two pieces, be sure to apply slightly firm pressure for about 10 seconds before setting down to completely dry. Once all of your pieces are glued together, allow to dry completely for 24 hours. You will need an unbreakable surface when you have to screw in the hooks later on. 8. While your blocks are drying, it's time to spray paint your cup hooks to match your copper display stand! Use discarded styrofoam to poke your hooks into so they stand vertically; this will allow for more even and productive spray painting. Allow to dry for 24 hours (ideally 48 hours is best to cure). 9. 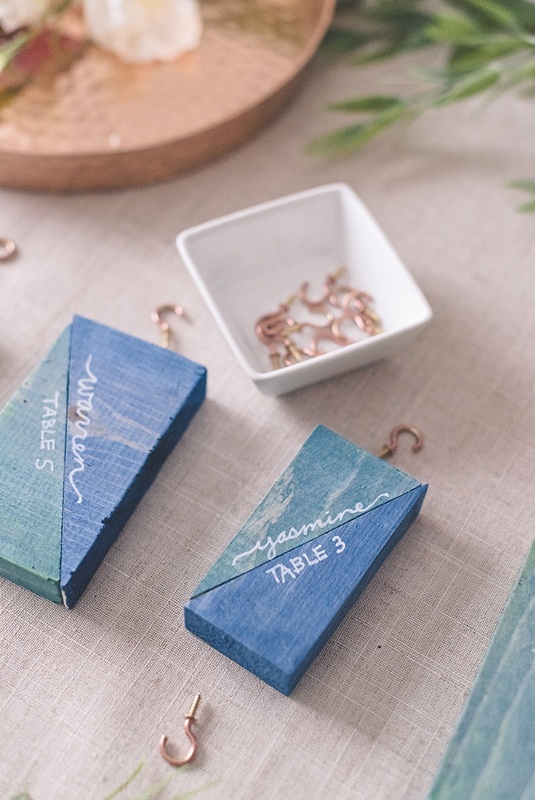 Alphabetize your guests' names, and start writing their names on your blocks and "Find Your Seat" on the banner wood with an oil-based paint pen. If you're not confident in your handwriting skills, grab a friend or a calligrapher to make it happen. You can also use an electronic cutting machine (e.g., Cricut) to cut out your names and title with either iron-on or vinyl. 10. Screw your copper-painted hooks on the banner wood with the amount of columns you need as well as the tops and bottoms of your guest blocks to allow you to make "chains." 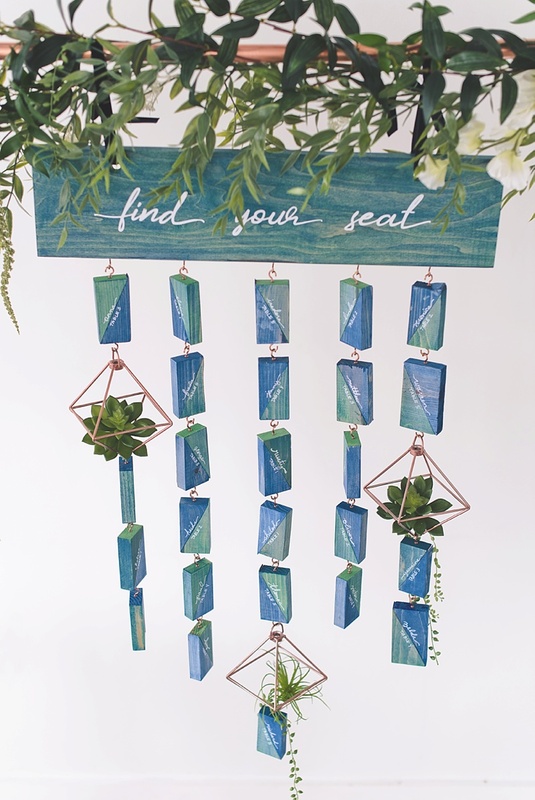 Your last block of each column may or may not need a bottom hook, of course, depending on your pattern and seating chart decor. 11. 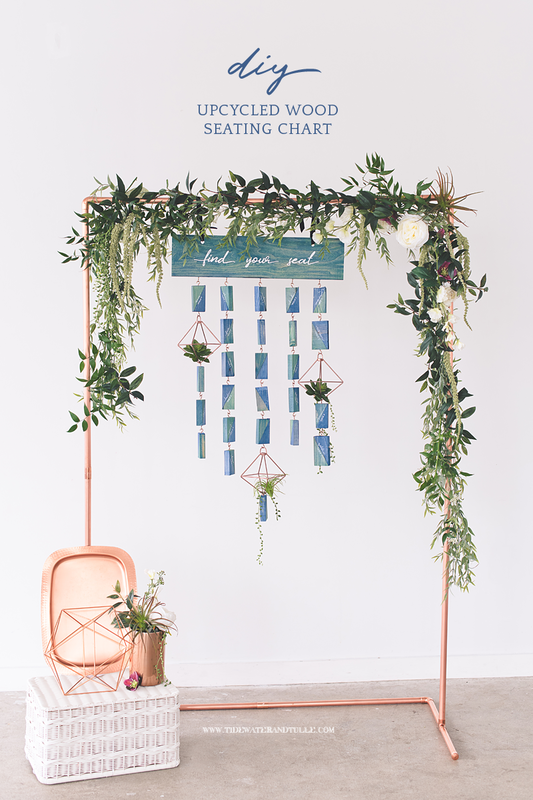 Set up your copper display stand at your venue. Tie velvet ribbon through your banner's holes and hang onto your stand. Hook your blocks together and decorate in your preferred style. 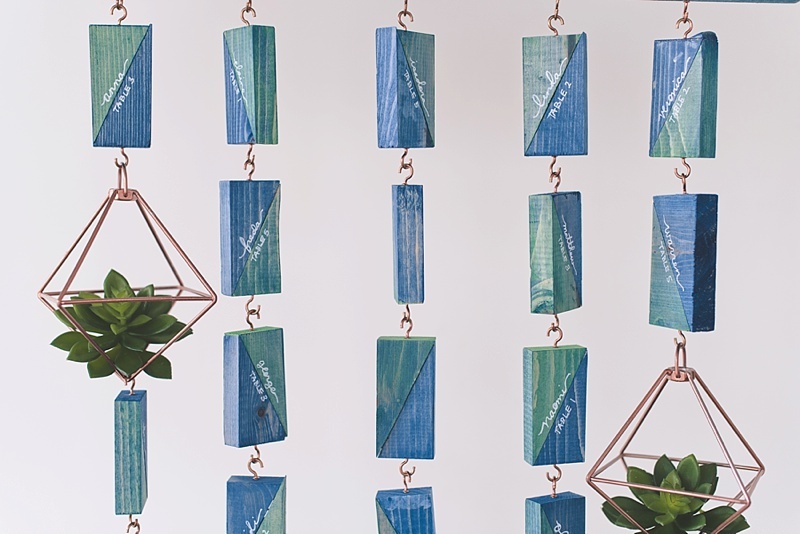 SOURCING TIP: Etsy to the rescue again when it comes to gorgeous custom copper display stands! 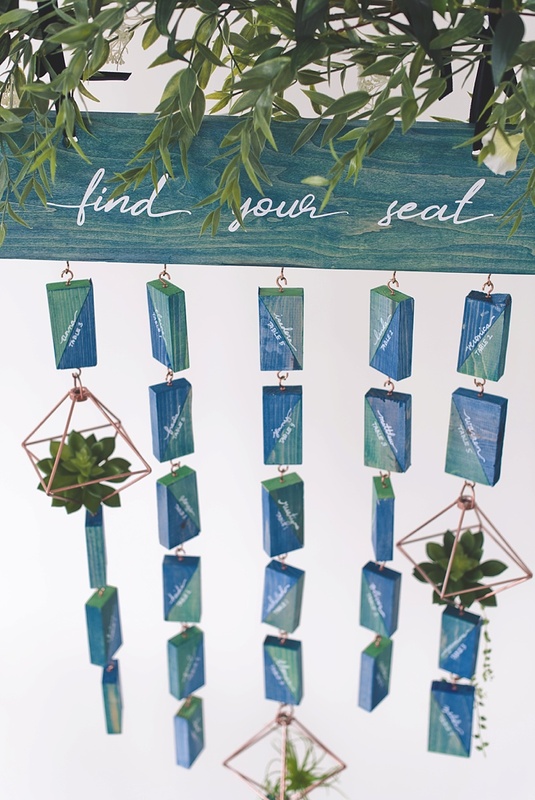 Since we're busy like the next couple and need some pro DIY help, we discovered that Mariam of Oh Kawaii Dreams will create any kind of copper stand according to your measurements. 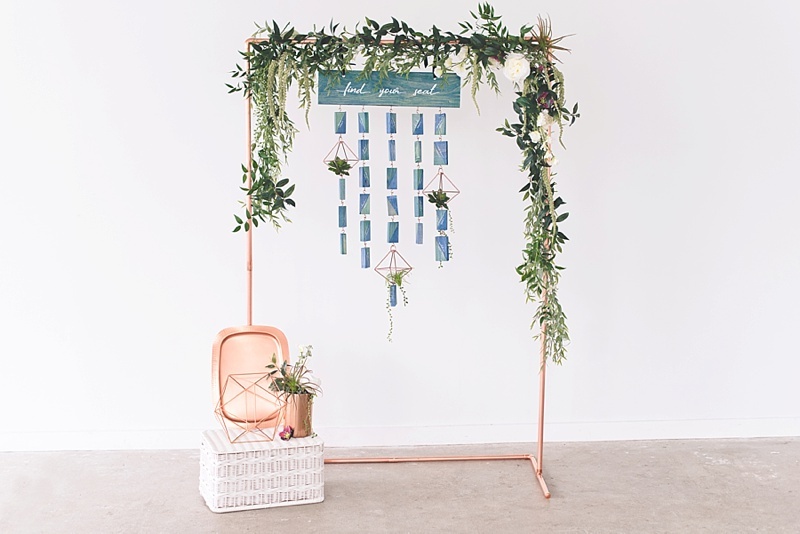 Our stand is 6' tall and 4' wide which is a little larger than a standard seating chart display, but we took our floral design in mind when planning out this tutorial. If you plan on decorating your seating chart, be sure to keep in mind what decor you'll be using when determining your measurements. 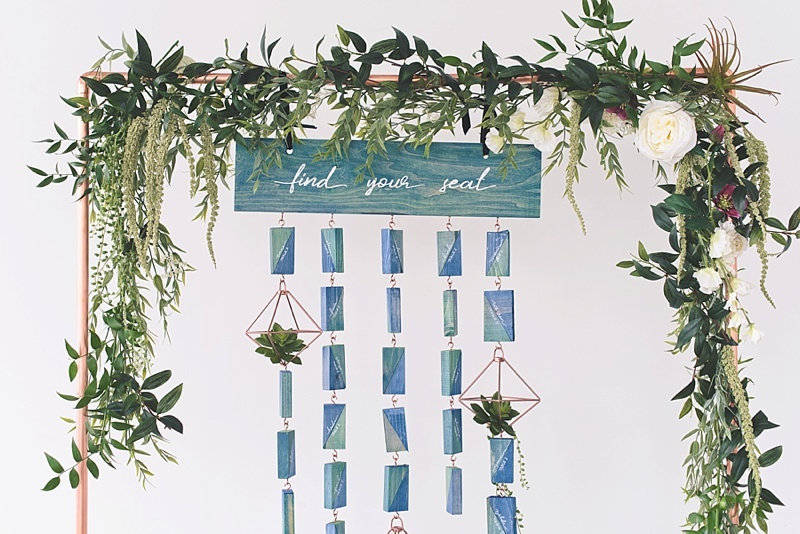 When designing how your seating chart will be displayed at your wedding, consider the venue space and consider the colors you've used in your project. 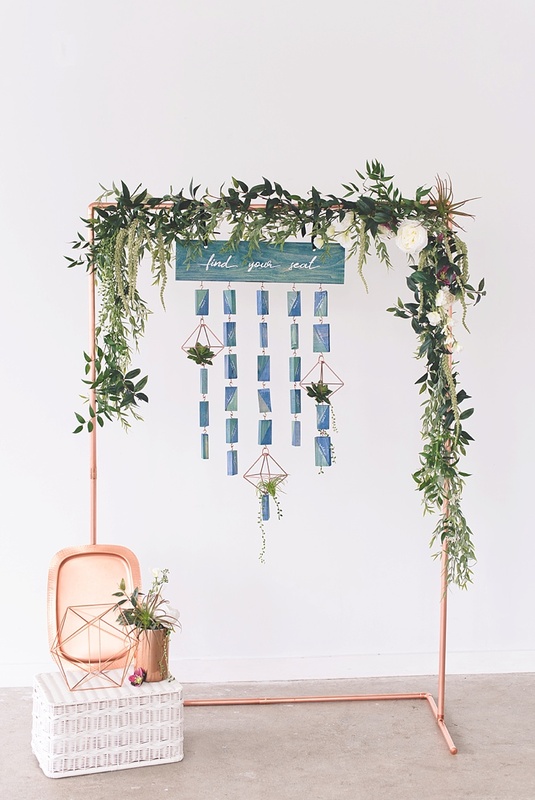 For florals, your professional florist can decorate your seating chart for you if you prefer to not do this yourself. It'll certainly save you time! 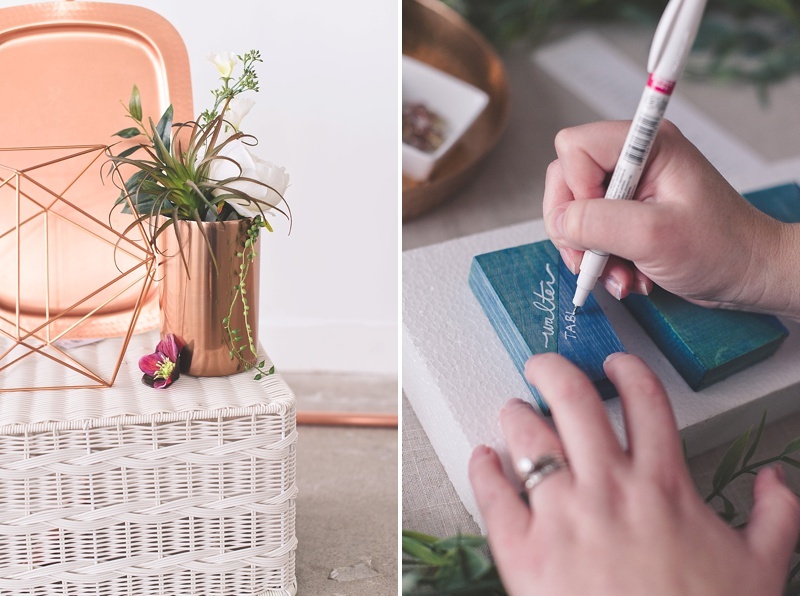 If you do decide to DIY it in a similar lush style, plan on giving yourself or your wedding team at least an hour or two on the day of to decorate since much of it cannot be done beforehand without the stand being setup already. There are some beautiful silk or faux flowers out there (which is what we used!) so you can at least arrange and plan out before the big day. 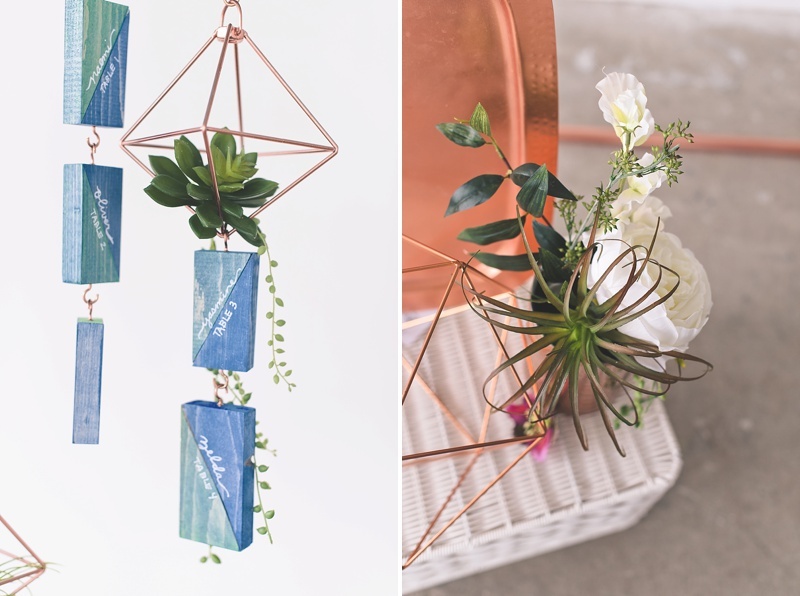 Floral wire is your best friend for tying your flowers and garlands onto your copper stand. Consider textures, sizes, and shapes of your flowers and greens for visual interest. For our floral choices, we used ruscus, amaranthus, hellebore, pearl succulents, air plants, succulents, sweet pea, and cabbage rose. Ultimately, have fun and coordinate with your overall wedding theme for a truly special handmade statement when you tie the knot!